WHAT SOME PROUD PARENTS JUST SAY! WHAT JUST ONE GRAD SAYS! BRADY®, now an INTERNATIONAL RECORDING ARTISTS from MusicTech Kids to Carnegie Hall to Disney the Pentagon & more! become a PATRON of their ART! U.S. DEA National Heradquarters ofr 25th Anniv. Red Ribbon Rally! 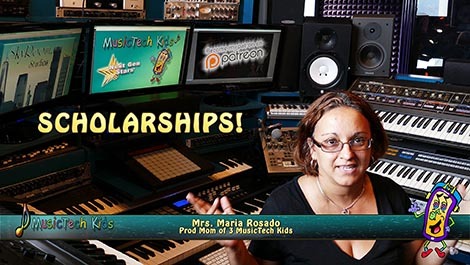 "Thanks to David Musial who has started MusicTech Teens programs, just one of many of his ventures that inspire musicians/artists of all ages. Rick used to help David back at Stevens with recordings at SkyRoom Studio back in the late 90s for his "party cds", and was his student of a Music Techology course at one time. Rick reconnected with David and found that the "technical aspect" would be intriguing to Eric, so he started piano lessons with him this past year, and David has really given such a broad experience on all things about music technology. 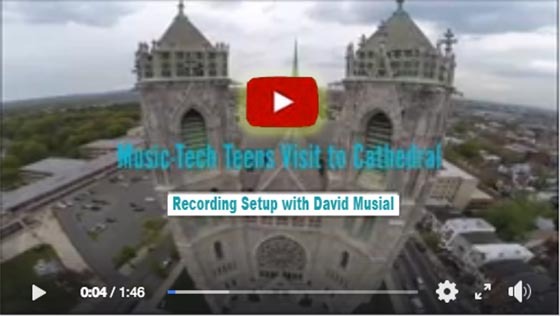 When Eric visited the Cathedral Basilica of the Sacred Heart in Newark to help out David with the sound for the recording of Spanish choir, I was inspired to take a small portion of video. The choir was amazing under the direction of Olfary Gutierrez. When I asked for permission to share the video Olfary agreed and wrote: "There's nothing more exciting than working and worship together serving God, the one who is the author of our very existence." 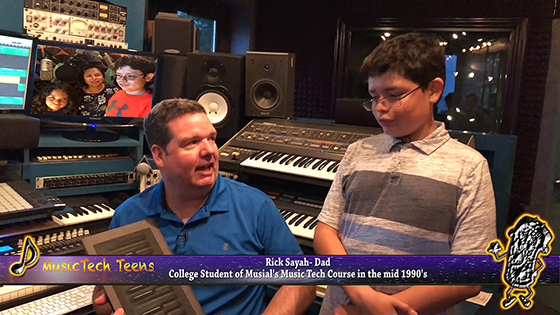 In the mid 1990’s college student Rick Sayah took the first course to ever be offered in Music Technology at the prestigious “Stevens Institute Of Technology”. The douse was designed by award-winning Professor David Musial. He enjoyed the course so much that he applied and participated in an internship at Musial’s unique SkyRoomStudio.com. The institute and studio acre located on the NYC gold coast of the Hudson, across form midtown Manhattan! Some 22 years later Rick learned of Musial’s trademarked “MusicTech Kids® and MusicTech Teens™ program. He sent Musial an email stating that his course was the BEST he vert took at “Stevens”. Rick married lovely lady named Sheila who also attended Stevens, and he earned a degree in their most famous program in Mechanical Engineering. He went on to own an elevator company in NYC! Rick hired Musial to teach his son and the rest is current history in the making! "I could never have imagined that my life would be changed so drastically by such an incredibly intuitive professor!" •Started lessons at ages 6 & 8, Recorded 2 albums and many music videos at SkyRoom. National tours for crowds as large as 16, 000 kids when they were just 12 & 14 years in age. 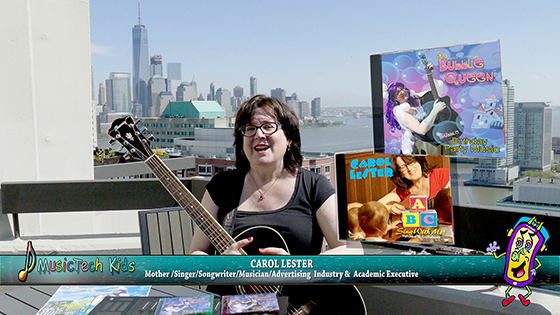 "MJ" hostd over 100 live Music Video TV shows in NYC. Perfoirmed in lots of DARE geaduationa, Roller Rinks, in the D.E.A. National Headquarters, on an Aircraft Carrier and even in Disney. Manny named his first child "David" after Prof. Musial!!! ANGELIKA (11) " David Musial is the BEST TEACHER IN THE WORLD! David is a very animated teacher, he "paints a picture with music"." •Writes songs and plays the piano & organ in church at just 11 years old! • Made a music video, is on on iTunes, sings, plays piano & organ in church, at a wedding... only 7 years old! "David has been a phenomenal teacher... He successfully integrated technology into the lessons as well...David is not only a great teacher, he is someone with a passion and lots of positive energy, someone you would trust your child to be around with knowing that he will transform his knowledge to an amazing experience for your kid! I am so proud of you and the impact you are making." ANDREA (6&8) "David has been not only a great producer, but also a welcoming host and made my daughters feel comfortable in this setting. The work with David was inspiring and memorable for them." •Wrote and recorded 4 original song, are on iTunes and made a Music Video at only 4 & 8 years old! "OMG Thank you... like I said you are a blessing to my boys, lessons with you is something they could dream of! They were Mesmorized with everything! You were God sent to mentor my boys.. No words to express our gratitude " You are an inspiration, God Bless you. They look forward to meeting with you! JAMES (11) "You were inspiring them. You are an amazing teacher. You are very kind, you have great ideas and always look on the bright side! You are the greatest teacher for James. He improves in his behavior and in his music skills. I feel very lucky to have you as a teacher. Thank you for everything in my life." Jamie Ecock, Mother. ATHENA (6) •Made a music video wih Maciej at just 6 years old! GRADUATES These are excerpts of some of the many letters Prof. Musial has received of the 20+ years at universities. Kenneth Bachor "I have learned so much from you that I will certainly use in my professional future". ABC News, ROLLING STONE & SPIN MAGAZINES, TIME Maagazine! Arnand Kularajah "You are a professor I will always remember best of all!" Eli Robbins "The experience I had in your studio was indeed GOLDEN. You were absolutely 100% crrect, I learned more in the summer with you than I could have at SONY Studios. The opportunity you provided to me was an invaluable addition to my music, it was a summer I will never forget!" Joel Condon "I want to thank you again for everything you have done for myself and the Music Technology majors. I am still dumbfounded by how many important people I met. I fee we accomplished a lot and my classes turned out great." Matt Kapuchinski "I want to thank you for my independent study this summer, your imput really drew me towards a pursuit of a career on the "creative" side of the biz"
Michale Zavorskas "Thank you for the oppotyunity to sit in on two classesin your program ... it was a great experience...Music Appreciation and Music Through Multimedia Technologywere very interesting." Michael Chladil "I must say that this has been without a doubt the most unpredictable semester I have ever had... I want to express mythanks to you for these opportunitiesand to tell you how much I enjoyed learning from you... I would like to learn more about the Music Technology field and would definately be interested in working with you for another co-op term... thank you for a positively wonderful experience.